On December 30, 1906 Mozafar-al-Din Shah Ghajar at last signed1 "The Constitution" that made Iran a parliamentary democracy. A week later on the 8th January 1907 he died and was succeeded by his son Mohammad Ali Mirza who was duly crowned on the 19th of January. The new Shah had been looking forward to this day when he could exercise the same autocratic powers of his predecessors and was intent on fighting the limitations of his authority laid down by the Constitution. He began by a dismissal gesture towards the Majlis Deputies by not inviting them to his coronation. He forbade the Cabinet Ministers to appear before the Deputies to answer questions. Many of the autocratic governors continued their brutalities against the people of provinces and in spite of demands by the Deputies that the Shah should dismiss these tyrants; they remained and continued their practice. It was no surprise that disturbances began to occur in almost all parts of the country. 18 months later during June of 1908, the King practically abolished the Constitution and imprisoned many of the reformists and signatories to the "Declaration of Constitution" in Baghe-Shah. Some of the Constitutionalists took refuge in the Parliament building but the King's Cossack Brigade bombarded the Majlis on 23rd June 1908. A number of people were killed and many were taken prisoner. Thus the king began his short-lived authoritarian and absolute rule. Haj Ali Gholi Khan "Sardar Asad the 2nd"
Najaf Gholi Khan "Samsam Saltaneh"
The uprising of the Bakhtiaris against the tyranny of the Monarch and the Governor began in Isfahan while Sardar Asad Bakhtiari was still in Europe for medical treatment. January of 1909 opened with a violent unrest in the city caused primarily by the treatment of the citizens by the Governor and mistreatment by Isfahan troops. People of Isfahan had suffered long at the hand of the Governor. The new Governor appointed by Mohammad Ali Shah was as cruel as the previous one and it was evident that the King was using strong-arm tactics and was not about to give in to the democratic demands of the people. The clergy and the Bazaar merchants were also at the brink of revolt and supported the anger and dissatisfaction of the people. Advance party of Bakhtiari fighters led by Zargham-Saltaneh Bakhtiari attacked Isfahan and succeeded in ridding the city of their tyrant. 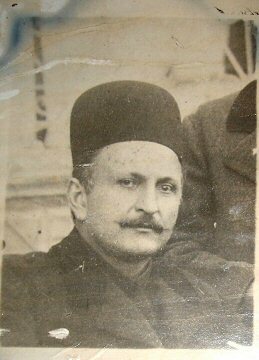 For his safety and protection, the Governor, Eghbal-Dowleh, was given sanctuary at the British legation by Mr. Grahame, the Consul-General, A few days later on January 5th 1909, Samsam-Saltaneh Bakhtiari himself with the main force of 1,000 Bakhtiaris arrived and took possession of the city. On January 8th, Samsam-Saltaneh ordered that Isfahanis appoint within 3 days, representatives for a local Constitutional Assembly and thus began the reestablishment of the constitutional order in that city. The example of Isfahan was soon followed by Rasht where on February 6th, 1909 the Nationalists attacked the Governor's house. The Governor was killed and his soldiers took refuge at the Russian Consulate. 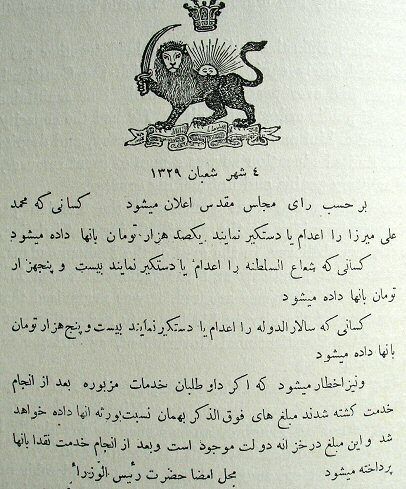 At this time Sepahdar joined the Nationalists in Rasht and as their leader, ordered the formation of a local Constitutional Assembly just like his fellow Nationalists had established in Isfahan. When the news reached Sardar Asad in Europe that the Constitutional movement was beginning to take shape and that Isfahan was now in the hands of the Bakhtiaris, he became concerned about the unity of the tribe and dispatched Youssef Khan Amir Mojahed (Bakhtiari) to Isfahan with the message to his brother that he should hold Isfahan at all cost and not to march on to Tehran for the time being. At the same time, Constitutionalists in Iran and Europe were pushing Sardar Asad to return to Iran immediately to assume the leadership position. 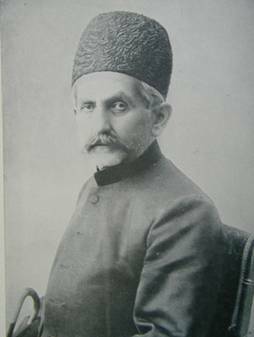 Taghizadeh, a notable activist and Professor Edward G. Brown were amongst those who met the Sardar in London and persuaded him to take charge of the revolutionary movement. The British sympathizers of the Revolution through the tireless efforts of Edward Brown had formed the Persia Committees (two committees: Parliamentary and non-parliamentary) with the sole purpose of promoting democracy and defending the Constitutional Revolution in Iran in spite of misgivings of the cabinet and especially the views of the Foreign Secretary Sir Edward Grey who was intent on adhering to the Russian-British treaty of 1907. Notable members of the Committee were Brown, H.F.B. Lynch (with commercial interests in Bakhtiari), Lord Lamington, Ramsey McDonald and other critics of Grey's Iranian Policy. Many meetings were held between Sardar Asad and members of the Persia Committees who promised their full support in the Parliament. With Isfahan already in the hands of the Bakhtiaris, Sardar Asad Bakhtiari accompanied by his nephew Morteza-Gholi khan Samsam, returned from Europe via Aden and Bombay to Khuzistan where he met with Sheikh Khazal to obtain his support and to give the Sheikh assurances that his authority and influence in the region would not be jeopardized. Sheikh Khazal also made a monetary contribution to the Bakhtiari campaign as a loan. Sardar Asad then rode to Bakhtiari territory to meet with other family leaders. After consultation with the most prominent heads of the branches of the tribe, Haj Ali-Gholi Khan Bakhtiari "Sardar Asad the 2nd" made his final preparations to march towards Tehran to join the marching forces of freedom fighters from the northern provinces and to form a unified front. The tribal council decided that Samsam-Saltaneh Bakhtiari should remain in Isfahan and hold the city so that in case Sardar Asad's forces were defeated, they could fall back on Isfahan and make a stand. Samsam-Saltaneh would also provide the troops with logistical supplies and support while his brother Sardar Asad was on the march. Sardar Asad began his fateful march towards Tehran in June of 1909 with 2,000 elite Bakhtiari troops and several artillery pieces. He had divided his riders into several cavalry units each headed by a trusted Bakhtiari Khan. Amir Mojahed, Morteza-Gholi Khan Samsam, Azizollah Khan, Amir Jang, Sardar Eghbal and other young Khans were in charge of these units. 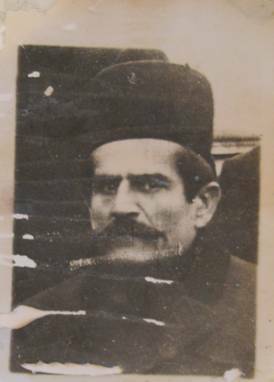 He had coordinated the march with his counter-part revolutionary, "Sepahdar" from Rasht. On arrival at Qom, a messenger of the British Consulate approached the camp and asked to see the Sardar. He was carrying a message from the British and Russian Consuls in Isfahan who had ridden hard to catch up with Sardar's forces and were asking to be received. An appointment was made for 10 A.M. the next day. The Consuls arrived promptly at 10 at the camp and after exchanging greetings, the British Consul began by saying that the war that the Bakhtiaris were waging against the Monarch was not against him alone but also against the British and the Russians interests. Sardar Asad replied that he was given a mandate by the nation to fight against the tyranny of the Monarch and to restore Constitutional Democracy in the country. The British Consul replied and reiterated that if the Bakhtiaris and other Constitutionalist forces continue their march to Tehran, the British and Russian forces will have no alternative but to enter into battle against the Bakhtiaris. After a few seconds Sardar Asad replied that he had no desire to fight the Super-Powers and would withdraw and return to the Bakhtiari territory; but before beginning such retreat, he would need from both envoys a formal letter addressing the issues they had just discussed and the ultimatum they had just given. The two Consuls promised that the letters would be issued right after lunch that same day. Sardar Asad waited until dusk and the letters never arrived.2 It became evident that the two Consuls had bluffed and were obviously acting without the explicit orders of their respective governments. It is also believed that the British envoy was playing a very clever political game by portraying to the Russian Consul, a fervent supporter of the Monarch, that the British were against the movement of the Reformists. Meanwhile Major Stokes of the British Legation was also trying to persuade Sepahdar not to advance. The nationalist forces of Rasht headed by Sepahdar joined the Bakhtiaris in the outskirts of Tehran. But before these forces joined up, an unfortunate incident happened. Two Bakhtiari chiefs, Amir Mofakham and Sardar Jang, had sided with the Royalists and were taking part in some of the skirmishes outside the Capital. Before marching into Tehran, Sardar Asad had sent a message to the Northern Mujahedin that their forces should meet up at a place called "Ali Shahbaz" just north of Tehran. In anticipation of this move, the Royalist Bakhtiaris together with some Cossacks commanded by Major Blazenoff and Captain Zapolski had taken position in the area. Sardar Asad had sent word to the rebel Bakhtiaris that he did not wish to fight his fellow clans men and suggested that they should return to Tehran and leave the fighting to the Russian and Persian Cossack troops instead. Sardar Asad having dispatched the messenger to the Royalist Bakhtiaris, continued his march and sat up camp at the rendezvous point. Earlier, the Royalist Bakhtiaris masquerading as Constitutionalists had attacked some members of the Northern Mujahedin Militia headed by General Yeprem. So when Sardar Asad's forces began their march to join up with the Northern Mujahidin, General Yeprem was not about to take any chances and a full-scale battle ensued between the two friendly forces. Sardar Asad's nephew, Azizollah Khan Bakhtiari and Samsam-Salteneh's son-in-law were amongst the many Bakhtiari casualties. After this mishap, it was ordered that all Bakhtiari Nationalists should wear an armband in order to be distinguished from Royalist Bakhtiaris. On July 11th 1909 Bakhtiari forces under the command of Sardar Asad, entered the Capital followed by forces led by his brother Samsam-Saltaneh and his son Jafar-Gholi Khan4 who had marched from Isfahan with fresh troops and supplies. For three days there was fighting in the capital. The Shah was intent on putting up a fierce resistance and ordered his Cossack Guard troops to bombard the city from a safe distance as a preliminary to an assault. The Silakhori soldiers stationed inside the city garrisons, sacked the Parliament building taking many of the Constitutionalists who had taken refuge there, prisoner. Several of the prisoners were hanged during the next couple of days and the rule of terror began to take over the capital. The freedom fighters nevertheless pressed on and took on the Cossacks in a frontal assault. When Colonel Liakhoff, the commander of the Cossacks realized that his troops were outnumbered and further fighting was fruitless, surrendered his sword to Sardar Asad and put his troops under the command of the coalition forces! A major turnaround and an ironic twist by the man who had been a great influence on Mohammad Ali Shah Ghajar for abolishing the constitution and ruling as an absolute monarch. Soon after their arrival in the Capital after bitter battles in Tabriz, the Mujahedin Militia of Azarbaijan began a rampage and were soon out of control in Tehran. They were naively under the impression that they could do as they pleased thanks to the prominence they had enjoyed but the situation had changed and not only they were of no further use, but they had now become a liability. These men were treated badly by the conquerors of Tehran; their wages were not paid and they were left to fend for themselves in a strange city. Many resorted to begging and extortion and became public nuisance. 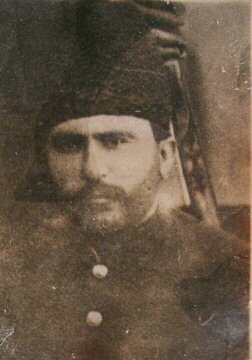 On August 7th 1910, Jafar-Gholi khan Bakhtiari (Sardar Bahador) and the Bakhtiari fighters under his command were given the task of restoring order. The Azerbaijanis were camped at "Atabak Park"6 and were not giving up their power to the Bakhtiaris easily. A gun battle ensued. After several hours of fighting with many dead and wounded on both sides, the Northern fighters were disarmed and were brought under control. 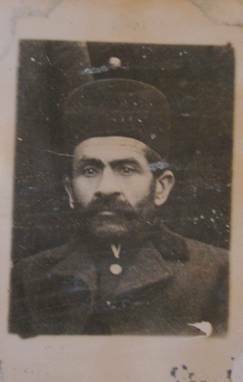 During the skirmish, Sattar khan was shot in the ankle as he was trying to climb through the chimney of a fireplace to hide. Bagher khan was also arrested and the two men were quietly taken to Samsam Saltaneh's official residence for safekeeping and treatment. The news of the arrests was not made public, as it would have had a terrible effect on the moral of the coalition. These two Azarbaijani leaders were eventually freed and lived a quiet life in Tehran after dismantling and dismissing their fighters and sending them back north. Sattar khan died in relative obscurity in Tehran at an old age and his compatriot Bagher Khan was murdered by bandits who ambushed the convoy he was traveling with on his way to Karbala for pilgrimage. It should be noted here that during the reign of the two Pahlavi kings it became their policy not to give too much credit to the Bakhtiaris for their role in the restoration of constitutional monarchy. Instead, roles of Sattar khan and Bagher khan were greatly glorified. Sacrifices and the bravery of the Bakhtiaris were only briefly referred to in school textbooks. After consolidating their control over the Capital and restoration of order, the two Bakhtiari leaders, Sardar Asad and Samsam-Saltaneh decided that for the sake of the unity of the family and the tribe, actions of Sardar Jang Bakhtiari and Amir Mofakham Bakhtiari should be forgiven. They were therefore once again accepted into the ruling elite of the family. Sardar Jang was sent to the Province of Yazd as Governor, and Amir Mofakham was given the Ilbagi of the Bakhtiaris and both were dispatched to their respective territories. Amir Mofakham was later given the portfolio of Minister of War in Samsam Saltaneh's cabinet. 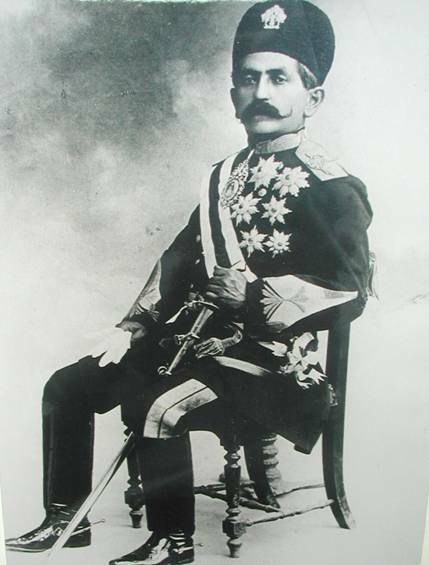 The ex-Shah made an attempt in 1911 to reclaim the throne by force; he had crossed the border in disguise, with arms and ammunition labeled "Mineral Water", and landed near Astrabad8. He organized a force and marched on Tehran but was defeated in Firuzkuh by the combined forces of Sardar Bahador and General Yeprem. The Government approved the funds for the campaign to defeat him and Shuster the Treasurers- General, even allocated funds for bounty on the King's head and two other princes who had accompanied him. Needless to say that his pension was promptly stopped!. The ex-king returned to Russia and from there to Italy where he lived the rest of his life and died in San Remo. 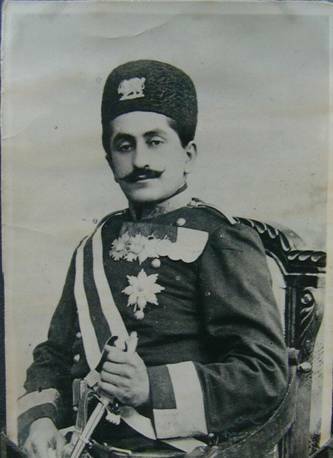 It is believed that Sardar Asad the 2nd, the leader of the Bakhtiari forces was approached by the British Charge d'Affaires in Tehran who suggested that if he should wish to declare himself Regent, the British Government would have no objections and formal recognition and aid would be forthcoming10. On the 7th of February 1912 Sir Edward Grey The British Foreign Secretary wrote to Sir George Buchanan, The British Ambassador in St. Petersburg that Great Britain will support choosing Sardar Asad as the new Regent.11 Sardar Asad refused the offer on the grounds that such position taken by one of the leaders would drive a wedge between the tribal chiefs and would result in the destruction of the family. A new cabinet was formed with Sepahdar as the Prime Minister and Minister of War, and Sardar Asad Bakhtiari held the portfolios of Minister of Interior. Samsam-Saltaneh Bakhtiari later replaced Sepahdar as Prime Minister. One year later Sardar Asad left for Europe for treatment for his eyesight, which was deteriorating. He returned a year later in poor health and eventually went completely blind. 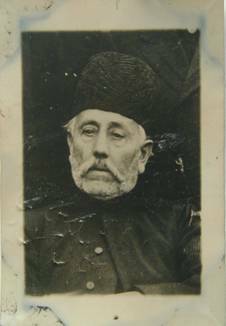 Towards the end of his life he suffered a stroke and died in Tehran in 1917. His body was taken on a gun carriage to the family mausoleum in Takhte-Poulad, Isfahan and buried with full military honors. A magnificent life-size painting showing him on a while horse, hung over his grave. Islamic Republic authorities in Isfahan are now in possession of the painting. An artist has been commissioned to make a copy of the painting. The original will then be taken to the National Heritage museum for safekeeping and the copy will be hung in its place at the mausoleum.